These series comprise radial needle roller bearings and a rolling bearing component capable of supporting axial loads. 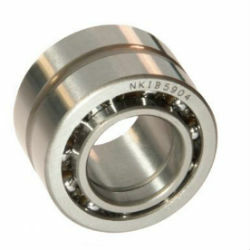 They can support high radial forces as well as axial forces in one direction, while NKIB can support axial forces from both directions, and are used as locating or semi-locating bearings. For lubrication, the outer ring has a lubrication groove and lubrication holes.